We're just a few days from closing the book on 2011, and oh what a year it's been! Since I'm not expecting anything too exciting to happen on the farm over this next week (boy, that's a dangerous assumption! ), I figured I would go ahead and take a look at my most popular blog posts from this past year. Before I share the links, let me give credit to @farmnwife for the idea of an end-of-year round up. I'll also make the observation that most of my posts relate directly to what we're doing on the dairy farm, but my most popular posts of 2011 aren't about how many cows we milked or what crops we were harvesting. Might that be telling me something? 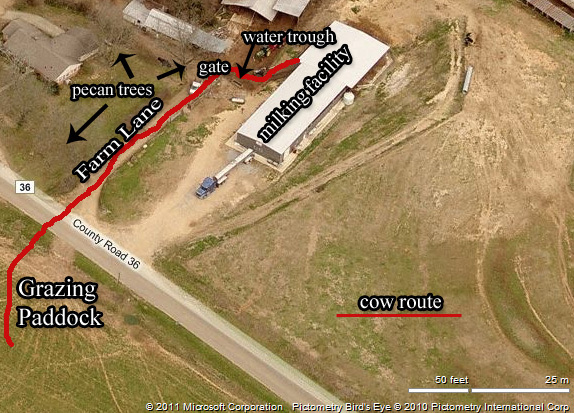 incident map from "Occupy Farm Lane"
Dairy cows stage brief "Occupy Farm Lane" protest (Oct.17)- What started as a silly Twitter spoof on the #Occupy movement turned into my most popular post of the year. Looking back at 4/27/11 (May 3)- A few personal observations on the day Alabama will never forget, as well as several links to the tornadoes' effect on the state's agriculture industry. The Dairyman versus the Family Vacation (June 21)- Spending time at the beach with my wife and kids was relaxing...until I started thinking about farm work. My Dad: a farmer and a family man (June 19)- A short Fathers Day tribute to my dad. How "young" should a young farmer be? (May 18)- 35? 40? Taking a look at question that pops up from time to time in agricultural organizations. Big deer, big problems (Dec. 4)- Deer can cause plenty of problems for farmers, but sometimes the deer hunters are an even bigger issue. Thank you all for your readership and support of The Dairyman's Blog, and have a "dairy" good new year! 9:00-who knows?pm: Ho, Ho, Ho. Of course, my schedule is subject to change if we get a call that we have heifers out, a cow needs assistance delivering a calf, or some other unforeseen (but not surprising) farm issue should arise. But somehow, someway, I'm going to enjoy time with both sides of the family, eat too much, and still find time to reflect on the true meaning of Christmas without missing much time on the farm. Please enjoy the following little bit of holiday cheer and, from my family to yours, have a "dairy" Merry Christmas! Our two regularly scheduled weekend workers have expressed that they intend to work all four weekend shifts, so that will thankfully take a little bit of pressure off of me & Dad. Merry Christmas to us! Without exception or excuse, every day is a work day on our dairy farm. We'll rack up between 7-8 hours of actual working time even on days when we cover only the basics (milking and feeding). On a cool, rainy day like today, it would be nice to get off so lightly...handle half the chores before breakfast and the other half after lunch. But when we have other things that need to be addressed, we address them regardless of the weather. This morning won't go down as one of our most productive, but we did get a few things taken care of. We sorted out and bred three heifers before retreating into the barn to repair a gate-opening pneumatic cylinder and two water trough floats. We also had to treat a cow for milk fever by giving her an IV of CMPK solution. We held off on making the feed rounds through the heifer pastures until the rain slowed to a drizzle, but as luck would have it the bottom fell about as soon as the guys pulled away with a truck full of feed. One they finished, we knocked off for lunch a little early so we could all have a little extra time to dry out our work clothes. Lunchtime is over, so I guess I'd better slip back into my damp overalls and head over to the dairy barn for the afternoon milking. A dairyman's gotta do what a dairyman's gotta do! My wife dropped my son off at the dairy after school dismissed this afternoon, but she didn't bring a change of clothes for him. So there he was, wearing good jeans, a white shirt (white! ), and his tennis shoes. In an effort to keep him as clean as possible, I brought a short bucket into the parlor and told him to sit on it. We were going to be milking cows for another hour-and-a-half once he got there, and I knew there was no way he would stay on that bucket for that long. But, the longer he stayed seated the less chance he would have of returning home with a greenish-brown manure stain on his clothes. Two mintues later he was up roaming all around the parlor. Predictably, he was sporting manure splatters on his clothes in no time. Did it bother him? Of course not...he's just a typical farm kid! He enjoyed "helping" us in the barn without a care about the foreign materials that occasionally landed on him. Now that the day is over, one question remains: who gets to do the laundry? 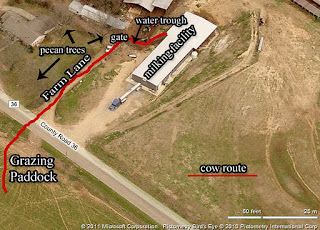 Our farm is situated along a two-mile stretch of the main road running from AL-Hwy 17 to Winfield. People can oftentimes see our cows as they drive by because several of our fields and pastures are visible from the road. This also means they see lots of deer on our property this time of year. Occasionally a big buck is spotted, and word spreads like wildfire. A few family members and family friends hunt on our farm, but for the safety of ourselves and our cattle we don't want just anybody running around our farm with a high-powered rifle. "Just anybody" includes hunters whose lust for a "trophy" trumps their ethics and/or respect of others' property. These folks probably know who they are, so they never ask permission to hunt. The reward of a big set of antlers outweighs the risk of getting caught, so they hunt wherever they think they can kill a big buck. Deer season has only been in a couple of weeks and I've already had two problems with these types of outlaw deer hunters. I was planting a seven acre field the week of Thanksgiving and noticed two tree stands along its back edge. One belonged to a friend of mine who comes to hunt 2-3 times a year. He set it up last season with the expectation of hunting out of it again this year. I'm not sure where the second stand came from, but I could see a deer feeder hanging in the woods not very far behind it. I also discovered a very big corn pile in the corner of the field not thirty feet in front of that stand. It's not illegal to feed deer in Alabama, but it is illegal to hunt where deer are actively being fed. Someone's decision to bait deer on my farm's property is costing me and my friend an opportunity to hunt there. The other problem happened this afternoon. My last farm chore of the day is to feed the calves in the pasture behind my house. After doing so, I pulled out my binoculars and looked across into the field I usually hunt in. I didn't have any intention of going out there today, but was interested in whether or not any deer were out and about. 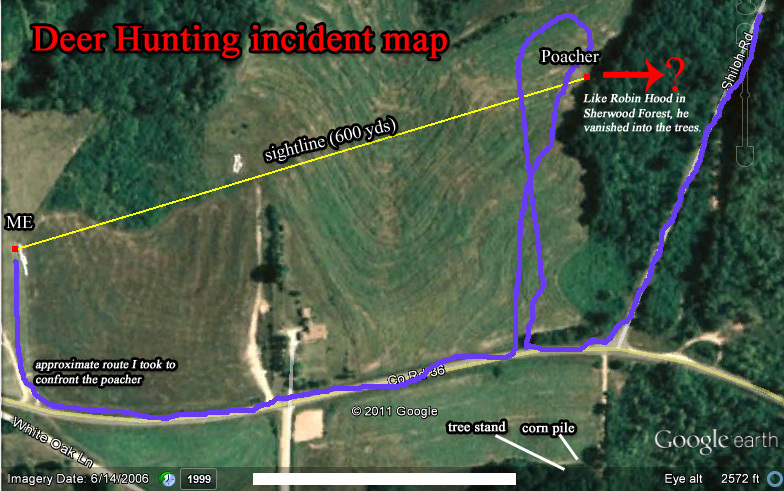 While scanning across the landscape, I saw something moving about 600 yards away. That something was a someone who didn't have permission to be there. Instead of calling Gamewatch to report someone hunting our land without permission, I decided I would just drive over there and ask him to leave. He apparently weren't interested in a conversation and ran off through the woods, leaving behind a nice camo jacket, a deer call, a flashlight, and a bottle of "doe pee". Deer season runs through January, so I'll probably encounter more problems between now and then. I just hope I can make it through the next two months without getting shot at by one of these idiots.